10,000 miles Earn 10,000 bonus miles after spending $500 in purchases on your new Card in your first 3 months of Card Membership. 2X 2 miles per dollar at US restaurants. 2X 2 Miles per dollar spent on purchases made directly with Delta. 1X 1 mile on every eligible dollar spent on other purchases. 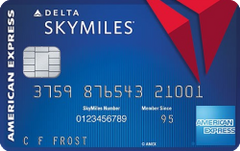 Our take: For fledgling cardholders not ready to commit to an airline card with an annual fee, the Blue Delta SkyMiles card is a good option to earn SkyMiles.